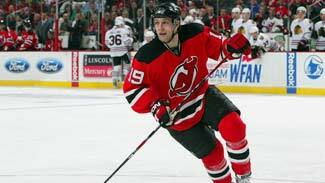 NEWARK, N.J. -- Center Travis Zajac played in his 388th consecutive game on Tuesday when the New Jersey Devils played host to the Atlanta Thrashers at Prudential Center, equaling a franchise mark established by defenseman Ken Daneyko 17 years ago. Zajac could set the mark on Thursday with his 389th appearance when the Devils travel to Ottawa to face the Senators. It's a streak he certainly hoped for, but never thought possible. "When you think about it, it is a lot of games," Zajac told NHL.com. "But that's the way I would like it. I would like to play in every game, like to compete in every game. That's the fun part about playing hockey … getting involved in the game. I know it's not fun to be injured and sitting out for games so that's why you keep up with your routine and preparation and hopefully it pays off." Really, though, Zajac hasn't been accustomed to sitting out anyway. He never missed a collegiate game in his two seasons at the University of North Dakota (91 games, 38 goals, 48 assists) and was sidelined just twice in five seasons with the Devils -- as a rookie in 2006-07. Zajac was a freshman when North Dakota advanced to the NCAA Championship. The Fighting Sioux reached the Frozen Four Tournament in his sophomore season. Calgary Flames defenseman Jay Bouwmeester holds the longest current ironman streak in the NHL at 496 games -- a streak that began as a member of the Florida Panthers on March 6, 2004. Bouwmeester established a new ironman streak for NHL defenseman when he took the ice Tuesday night against the Phoenix Coyotes. He entered Tuesday tied at 495 consecutive games with Karlis Skrastins. So what's the secret to remaining so durable? "Me and my brothers (Darcy and Kelly) wanted to get better to improve during the off-season, so we hired a trainer and went to train early on in our careers and that gave us a step in the right direction," he said. "We were figuring out how we could find the edge to become better and feel better on the ice." Daneyko's string of 388 consecutive starts began Nov. 4, 1989 and ended on March 29, 1994. Zajac's current ironman streak began Oct. 26, 2006, and ranks fifth among active players in the League. Preparation for a new season never begins in August; rather, it takes place much sooner. "A lot of it begins in the early summer months," he said. "For me, it's about getting myself in the best shape possible to play during the year. I do a lot of strength training, quickness, agility and sprints. I do anything that, in some way, shape or form, is going to help me feel better or be more flexible or be more agile on the ice. I try and do as many different things as possible by trying different things. "It's all about eating right and getting enough sleep … and making sure your body is feeling good." Daneyko, who played 1,283 games with the Devils in his 20 seasons, planned on congratulating Zajac at some point after the game. The 25-year-old Zajac has totaled 395 games over five seasons. "I haven't spoken to Dano yet … I haven't had any threats or anything like that," he said with the laugh. "But Dano is a guy who's been a presence in this organization. He was a physical presence when he played. He competed hard every night and left it all on the ice every night. So, for him, the reason why he had so much success in his career was because of all the effort and hard work he put in."